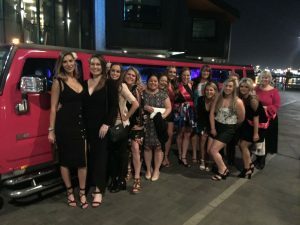 Want a hens night that you’ll never forget? Hire a Pink limo! There’s no better way to say goodbye to your single life than to hire a pink limo from Hummer X limousines to get you to and from your party venue in style, luxury and comfort. Stand out, get loud and let us take care of your hen’s party transfer and hire our striking pink Hummer limousines. Our professional and friendly driver will transport you and your lovely guests to your desired party destination or take you on a fun city cruise to party the night away. Our fun and exciting pink limos include dynamic sound systems, laser lights and luxurious appointments as well as icy cold bubbly and sparkling water to get your party off to a great start. 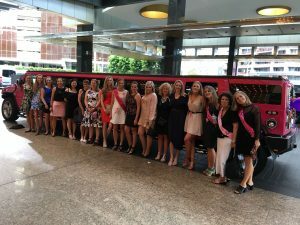 Whether you and the girls plan to have a big night on the town or a fun hen’s day out, call Hummer X limousines to help make your hen’s party a huge success. Our Hummer hire service can provide you with a Pink limo or Black hummer limousine for your bachelor party. Have your own ideas for an awesome party? Let us know what you have in mind and we can help cater a limo package to suit your specific requirements. Get in early and reserve your pink Hummer today! © 2017 Hummer X Limousines| All rights reserved.